Bringing the streamline era into the 21st century. Enjoy the event of a lifetime, traveling like royalty as you experience the luxuries of a private railroad car cruise. The Sierra Hotel offers a unique opportunity for campaigns, business entertainment and special family occasions. This private railroad car has been rebuilt from the wheels up to provide all the comforts of home while being capable of traveling at speeds up to 110 miles per hour. It is Amtrak® compatible and self-contained to ensure reliability. Glenwood Canyon in Colorado was the inspiration in 1944 for what was to become known as the Vista-Dome. 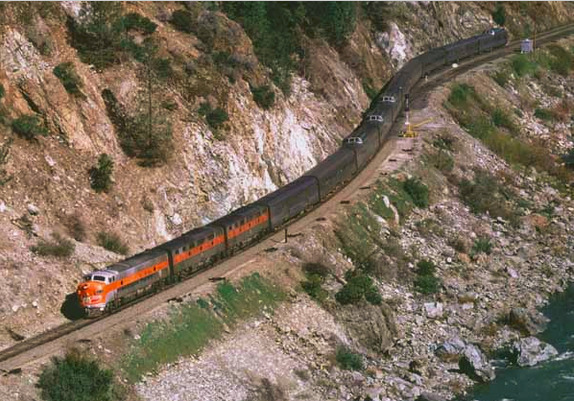 The concept was to provide a 360-degree view above the level of the train by including upper windows so as to enable looking up from the canyon bottoms at the dramatic scenery above, including the night sky. Built by the Budd Co. in 1948 for the Chicago, Burlington and Quincy Railroad, the Silver Lounge as it was named, was designed for, and was part of the consist of the California Zephyr, traveling the same route that had conceived the Vista-Dome. The Silver Lounge was a mid-train dormitory/coffee shop/lounge car which included the Cable Car Lounge, a crew dormitory and the rooms of the train’s Chef and Zephyrette hostess. The Sierra Hotel maintains many of its historical aspects which have been tastefully augmented and upgraded with modern technology to provide the most comfortable environment possible. Sierra Hotel crews are the ultimate hosts in making our guests feel at home, being attentive and hospitable without being overbearing. The food is fresh and beautifully presented. It’s been said that we offer “the luxury of a cruise ship within the confines of a submarine.” Simple elegance describes it best, bringing the best of railroad tradition into the 21st Century. There is no better way to view this beautiful continent than from the comfort of a vista dome. With so many scenic highlights, from the Hudson and Potomac Rivers, through the Appalachian Mountains, along the Great Lakes and the Mississippi River, across the Rocky Mountains in Montana, Colorado and New Mexico, to the Southern California coast, San Francisco Bay and Puget Sound, that one never tires of the scenery. There are any number of interesting cities to view and explore as well. Chicago, Washington, D.C., Montreal, St. Louis, Kansas City, MO, St. Paul, MN, Whitefish, MT, Los Angeles, San Diego, Portland, OR and Seattle all offer private car parking in the heart of the city.
" I travel not to go anywhere, but to go.